Etching, Anonymous, possibly by Master I.♀.V. ?, 31.4 x 28.1 L (Boston). Inscribed on a small tablet in the trees at the right edge center: 1543. Bartsch, XVI, 1818, 410, 85, as Anonymous, School of Fontainebleau, but certainly by Fantuzzi, after Rosso. Herbet, II, 1896, 281 (1969, 77), 42, as Fantuzzi. He quotes from Mariette’s Abécédario that one of the figures is taken from Michelangelo. Zerner, 1969, XLI, rejected the attribution to Fantuzzi and suggested that it may be by Master I.♀.V. COLLECTIONS: Boston, 68.558. London, 1850-5-27-113. Vienna, H.B.IV, p.75, no. 88. 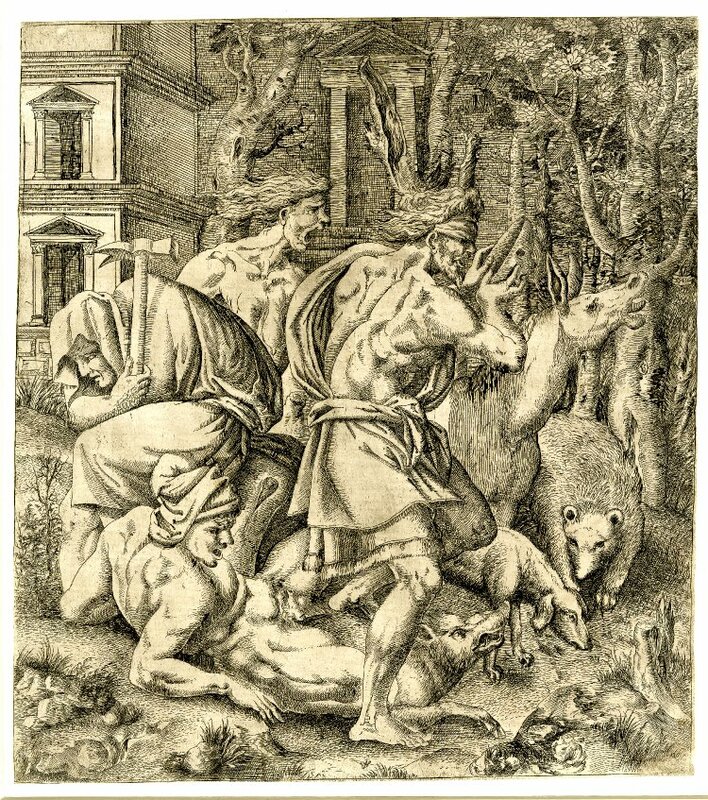 Mariette, Abécédario, 1858-1859, 21-22, as after Rosso and as by the same etcher who did the Silenus carried by Two Fauns, also dated 1543 [probably Robert-Dumesnil, VIII, 1850, 32, 28]. Kusenberg, 1931, 165, as Fantuzzi. 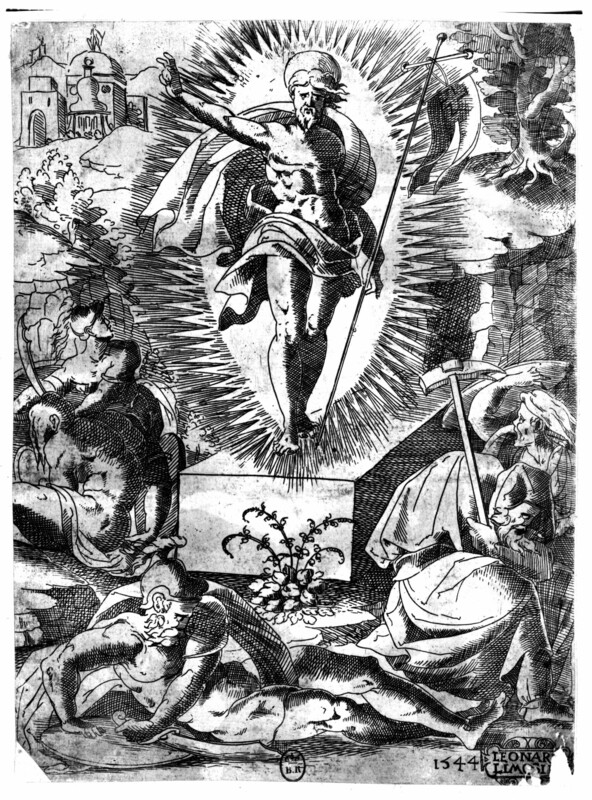 Zerner, 1969, XXXIII, states that the two figures at the right of Limosin’s Resurrection (Zerner, 1969, L.L.8) are taken from this etching. Zerner, IB, 33, 1979, 360 (London). Carroll, 1987, 46, 232-234, no. 72, with Fig. (London). Boorsch, 1988, 9, as by Master I.♀.V. 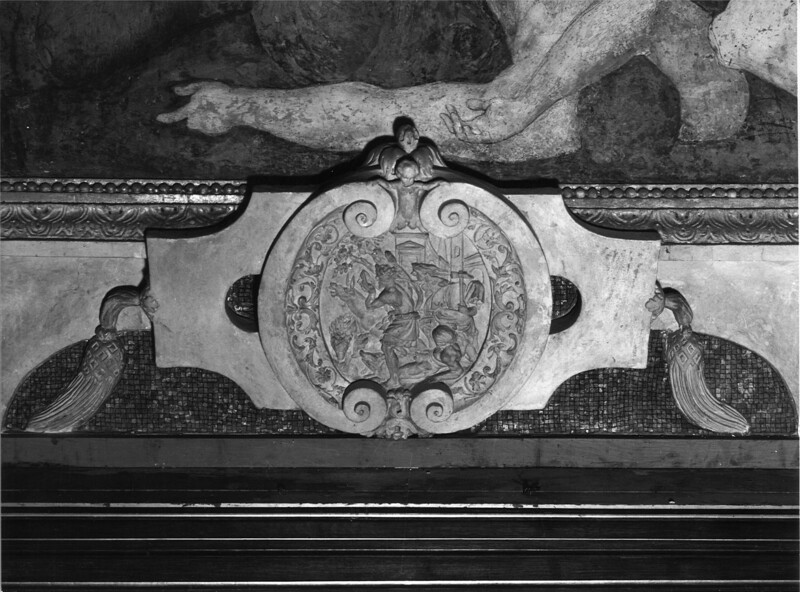 On the relation of this print to Rosso’s stucco relief in reverse under the Combat of Centaurs and Lapiths (Fig.P.22, I S c) in the Gallery of Francis I, see under P.22, I S, where it is suggested that the etching is based on a lost drawing by Rosso, the composition of which was slightly revised before the relief was executed. Zerner and Boorsch thought the print was by Master I.♀.V. 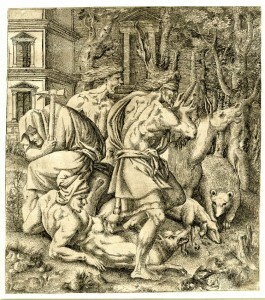 Two figures in Limosin’s Resurrection of 1544 (Fig.E.97) are related, but reversed, to those in this etching. But it is possible that Limosin’s entire scene goes back to a lost drawing by Rosso in which he used again his own figures.